In this guest post, renowned fire historian Stephen Pyne reviews the history of wildland fires in the United States and the policies and strategies various agencies continue operating under before offering some recommendations for dealing with the issue. On May 19, 1780, the skies over New England darkened ominously as an immense pall of smoke smothered everything for hundreds of miles. The smoke streamed from fires further west. The equivalent in flames arrived in October 1825, when roughly three million acres burned in Maine and New Brunswick. Together they announced a new order of American fire, one that would persist until the 1930s, or for New England until Maine burned a quarter million acres in 1947. Only a fraction of landscape fires get large, and only a fraction of those change history. What really matters is the patterning of fire on the land—its regime. The deep story is not of revolutionary burns that overthrow the existing order but of quiet regime changes in how people and fire co-occupy the land. Still, those big burns can act as historical markers and occasionally as political catalysts. That long wave of settlement fires sparked a political reaction. The havoc wrought by fire and axe—what Theodore Roosevelt called “scalping the land” and that incinerated towns and left hundreds of people dead—pleaded for government intervention. State-sponsored conservation was the result. In what became a global pattern, large swathes of land were reserved as public forests and given to foresters to oversee. All parties accepted controlling wildfire as an index of success. The bad burns continued into the 20th century. In 1903 some 600,000 acres and scattered communities burned in the Adirondacks. 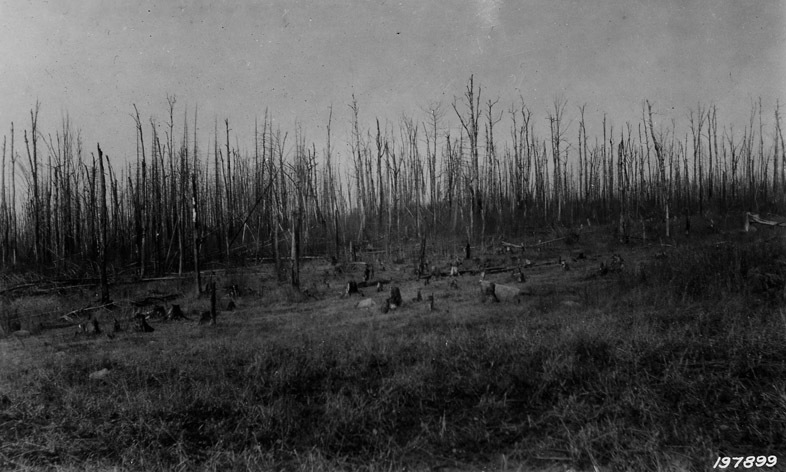 The 1908 fires rumbled along the U.S.-Canada border from British Columbia to Maine. The 1918 fires overran 1,500 square miles and killed at least 450 people outside Duluth, Minnesota; but that was the flood crest. The great vortex that had quickened decade after decade began to slow. Bad fires persisted, though with fewer fatalities, and then they faded into memory. What replaced that long wave were fires on the reserved lands. Here the galvanizing event was the Great Fires of 1910. The Big Blowup in August of that year marked the transition from conflagrations along the frontier handled by settlers (mostly by fleeing) to those on public lands under the jurisdiction of bureaucracies (which sought to fight them). The Big Blowup is a creation story for the American way of fire. The U.S. Forest Service was barely five years old. It had seen its charismatic chief, Gifford Pinchot, fired in January. The agency endured 78 firefighter deaths as monstrous fires swept over the Northern Rockies; it went nearly a million dollars in debt; and saw its presumption that it could contain fire sucked into the black plumes of the Big Blowup. Equally, that same month, August, it suffered a political brouhaha over its policy. A group centered in northern California argued that instead of following European models the proper policy should emulate the American Indian and kindle “light” burns that would keep the woods open, free of insect and disease outbreaks, and, by dampening fuels, free of damaging fires. When Richard Ballinger, the Secretary of the Interior, announced his support for the strategy, the controversy went political, for Ballinger had been Pinchot’s rival and the occasion for his dismissal. The options polarized. You stood with one or the other. You had to light fires or fight fires. The Forest Service elected to fight. The Great Fires were the first challenge faced by Henry Graves, Pinchot’s hand-picked successor. The next three chief foresters were all on the firelines that summer. The fires were for that generation a Long March, and those who experienced them determined they would never happen again. In fire’s aftermath, moreover, Congress passed the Weeks Act, which allowed the national forests to expand by purchase and which created a program of federal-state cooperation, based on fire control, that established the matrix for a national system of rural and wildland fire protection. The New Deal granted fire protection virtually unlimited resources, most spectacularly the Civilian Conservation Corps, about half of whose labors went into fire infrastructure and fire suppression. In 1935 Chief Forester Gus Silcox, responding to an outbreak of bad fires in the Northern Rockies, announced what became known as the 10 a.m. policy, a universal standard by which every fire would be controlled by 10 o’clock the morning following its report. 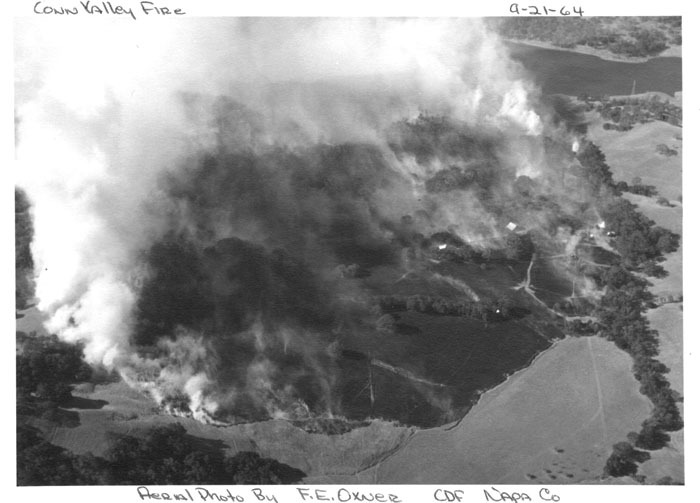 During the war years, fire was absorbed into national security concerns, and after the Korean War, mountains of war-surplus equipment were transferred, through the Forest Service, to federal and state fire programs. Half-tracks now pulled plows and carried pumps; B-17s dropped fire retardant. A cold war on fire was underway against the other “red menace.” The wave of frontier conflagrations passed. Then the consequences, unanticipated and unwanted, of indiscriminate fire control—of taking out good fires as well as bad—inspired a major reformation in policy. In 1968 the National Park Service broke ranks and announced its intention to restore fire where warranted. Ten years later, after being pounded by the 1970 and 1977 fire seasons, the Forest Service followed suit. In effect the prophecies of the light-burners had proven correct. The federal agencies converted to a policy of fire by prescription, of substituting controlled fire for wildfire. And they renounced the hegemony of the Forest Service in favor of interagency collaborations. All this occurred at a time when climatologists were warning of an inevitable ice age. Changes of this magnitude need not only time but space—geographic space in which to maneuver, bureaucratic space to accommodate a change in institutional culture and practice, political space to tolerate fumblings as new ideas express themselves on the ground. Instead, the fire revolution stalled, caught in the crosswinds of the Reagan administration’s attempt to roll back environmental legislation, reduce government, and transfer resources from civilian to military agencies. The onset of the Republican ascendancy ended with two violent, mesmerizing expressions of what the coming era of fire would mean. In 1988 Yellowstone National Park burned, and burned, through most of the summer. In 1991 the Tunnel Fire roared through Oakland, California, destroying 795 structures in the first hour. Both garnered plenty of attention, neither led to policy reforms. But the wild, the urban, and the border where they met and intermingled would define the coming era of American fire. Here and there critical fires acted like highway flares to track the transition. The 1994 season saw 34 firefighters die (15 at Colorado’s South Canyon Fire) and marked the country’s first billion dollar suppression bill. It led to the adoption of a common federal wildland fire policy the next year, as the fire community admitted that fire suppression was broken. The 2000 season saw big fires (again) in the Northern Rockies and a fumbled prescribed fire in New Mexico burn into Los Alamos; the community admitted that its whole program, despite fabulous firefights and logical wizardry, was broken. The National Fire Plan resulted. But if not too little, it was too late. A deep regime change was in motion as America found surrogates for that earlier wave. A new frontier of settlement rolled across the countryside, this time recolonizing rural America with an urban outmigration. Urban sprawl and exurban splash were jamming houses against wildlands and platting them within former agricultural lands. On both sides of what became a wildland-urban frontier fuels were flourishing as fire exclusion allowed wildlands previously swept by cleansing fires to stockpile combustibles and as former farms and pastures overgrew with trees and scrub. Powerlines assumed the ignition role previously held by railroads. Climate change replaced slash as a performance enhancer. Like a re-emergent plague, bad fires broke out, as they had during that earlier era of unsettled colonization. Again, too, there was no infrastructure for this kind of fire. Solid systems existed for fire in wildlands and for fire in cities, but not where they intermingled promiscuously. The wildland fire community saw the problem as one of houses encroaching onto quasi-natural landscapes. The urban fire community saw towns with peculiar, not-easily-subject-to-codes landscaping. Many exurbs sprang up outside any formal fire jurisdiction. The few instances where the two cultures of fire fused, as they did in California, were awkward and expensive. There were mechanisms for mutual assistance during emergencies, but no institutional matrix for governance. Who was responsible? Who pays? The age when a single agency could oversee a single policy with a single goal had long passed. Fire’s control had yielded to fire’s management; every landowner had their own fire program to satisfy its special purpose and charter. The number of players at the table became too large to actually sit around the table. The country needed a way to orchestrate all the pieces: it needed the fire equivalent of a constitution to spell out rights and responsibilities and to allow interests, some of which complemented, some of which competed, to come together in a way all parties regarded as legitimate. Its needs were less about money than about social and political capital. The 2009 FLAME Act required, as an aside, that the federal agencies fashion a “national cohesive strategy” for wildland fire. That project has moved beyond planning to bureaucratic routine but it came with no political power and no new funds. In keeping with the fire community’s preference for threes, it divided the country into three regions (north, south, and west), and it identified three goals: to promote more resilient ecosystems, to fashion more fire-adapted communities, and to improve capacity to implement. The NCS remains fundamentally a talk shop. In 2017 Utah enacted its provisions into law. By World War II the old wave of frontier fire had ebbed. That happened not by the gravitational tug of natural forces but because of active intervention. The new wave continues to surge; almost annually new “worsts” appear; and it’s not obvious that even a horror like the Paradise fire is enough to reverse that surge. A century ago the country had absorbed a gallery of horrific conflagrations without rising to political outrage. Why shouldn’t the United States accept mass burnings as it seems willing to accept mass shootings? But if the 2018 California fires, piling on to those from 2017 and others of 2018, do rouse political attention, what needs to happen? We need, first, to ensure that fire is not hijacked to other agendas. Fire is so telegenic, so visceral, that it can stir emotions, and there are plenty of partisans willing to redirect fire’s captivating quality to argue for other causes like logging that do nothing to solve the fire issue. Second, as the national cohesive strategy recognizes, neither the wildland nor the urban side of the frontier can solve the issues on its own. America does not have a fire problem: it has many fire problems. Each needs to be handled on its own terms, and where they collide, in ways that make a difference to each side. Urban fire services work badly in the woods. Wildland fire management is a non-starter in cities. Third, define the concerns correctly. It makes more sense to consider the (fatuously named) Camp Fire less as a wildland fire that ran amok than as an urban fire for which the towns in its path were ill-prepared. It means finding suitable analogies. Rather than a war on fire, we would be better served imagining the scene as a problem in public health for which vaccines, quarantines, and select emergency response might halt contagion. It also means finding the right narrative. These kinds of fires are no longer a California pathology. They have moved to Colorado’s Front Range, Los Alamos, Oklahoma City, Bastrop County (Texas), and Gatlinburg, Tennessee. It’s not just that people are building houses where there are fires, but that fires are going to where the houses are. And, finally, admit that fire is a legitimately political issue, not just an occasion for “disaster theater,” but for rethinking how and by whom fire on America’s billion burnable acres should be handled. Fifty years ago one federal agency, the Forest Service, was replaced by interagency arrangements; now federal institutions must engage with state foresters, county officials, city and volunteer fire departments, fire protection districts, and a civil society with NGOs such the Nature Conservancy and the Coalition of Prescribed Fire Councils. We need an arrangement that clarifies the roles for each. Now the Dark Days have returned. Whether they pass depends on what we choose next. We can respond. Fire simply reacts. Stephen Pyne is a professor at Arizona State University and the author most recently of Between Two Fires: A Fire History of Contemporary America and To the Last Smoke, a 9-volume series of regional fire surveys. He’s also the author of the FHS Issues Series book America’s Fires: A Historical Context for Policy and Practice, and a frequent contributor to the blog.